I tried it there and then and I liked it. I have been practising mindfulness, to a greater or lesser extent, ever since. The point I want to make is that I began to practice mindfulness after reading that paragraph, and so can you. You don’t have to undertake lengthy periods of focussed meditation - such periods were probably designed for people living as Buddhist monks or nuns and not for those in the hurly burly of wider society. Mindfulness is an attitude you can bring to your experiences as you go through your day. The purpose of the short practices I write about here and elsewhere (including my forthcoming book Mindfulness on the Go) is to remind us to be mindful. If you spend a few minutes every day observing your breathing and perhaps another few minutes observing your posture as you walk or sit, without getting caught up in thoughts as you do so, this should help you to bring a useful degree of mindfulness to your normal activities. 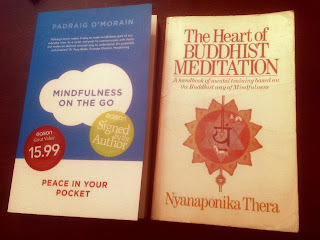 (The author of the book was Nyanaponika Thera and its full title is "The Heart of Buddhist Meditation - A handbook of mental training based on the Buddhist way of Mindfulness.") His book, The Power of Mindfulness, is free on Buddhanet.